The nights are getting warmer……. Our daily forecast does not change much all year-sunny and 32c. However, the nights are getting warmer! Our minimum is suddenly 25c and the humidity is going up…soon we will be hearing “sunny and 32c with a chance of an afternoon shower”. They are even teasing us that it may happen next week….time will tell! The frogs are getting vocal, so it may be true! 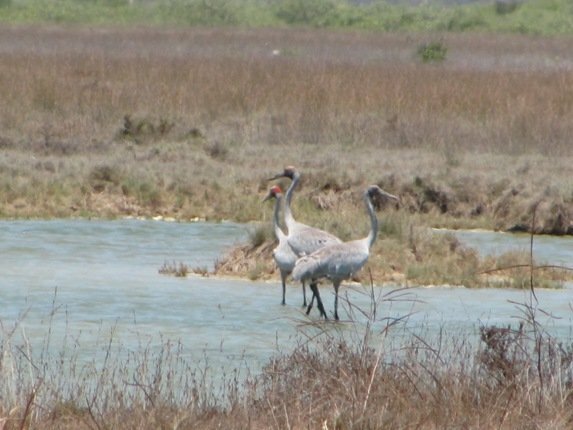 We know the land is drying out as we have had Brolga Grus rubicundus return to the dry scrub behind the speedway and rodeo ground in town. They take advantage of the sea coming right into that area on the big tides and a small flock has arrived this week. Brolga are extremely long-legged birds and the female is smaller at 77-113cm, with the male towering at 105-134cm and standing up to 140cm. Their wing span is between 1.7-2.4m and unmistakable. The Sarus Crane Grus antigone is smaller and less common-distinguished by the lack of dewlap under the chin. 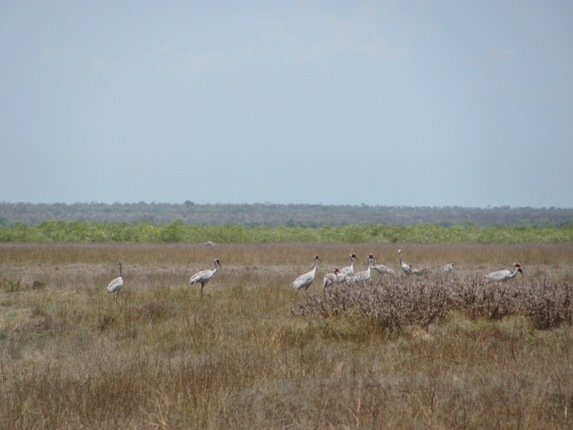 The largest group of Brolga that we have seen locally was over 700 birds as a lake was drying out at the end of the Dry season a few years ago. They are famed for their “dancing” displays, which are performed by both sexes as they jump, trumpet and display. They breed from July to March in Southern Australia and from September to June in the north. They often call with a whooping bugle trumpet sound in flight and the sound is similar to a Channel-billed Cuckoo, which are returning to the Broome area from Asia to breed. The Channel-billed Cuckoos will be placing their eggs into other birds’ nests-most likely Torresian Crows. 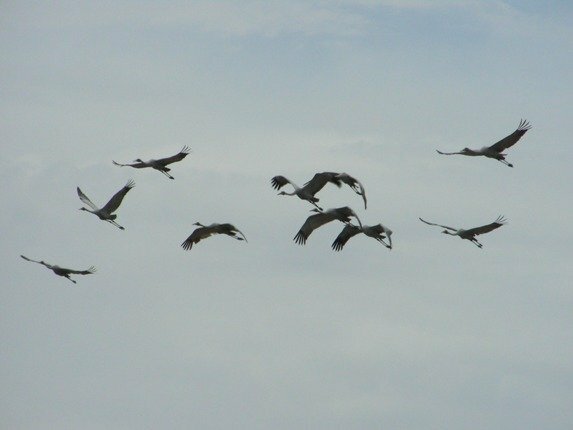 Brolga in flight-an amazing sight! 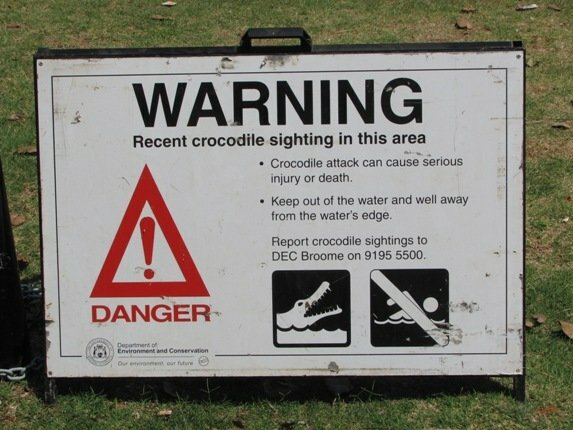 Of course we know the seasons are changing by one single sign at the local boat ramp….so the sea is warming up and the crocodiles are on the move….be careful! This humid season brings us not only thousands of shorebirds back into Roebuck Bay and crocodiles on the move, but mango season is here! The Great Bowerbird and Little Friarbird have realised that they are getting ripe and are trying to beat the Fruit-bats to them. We have decided to ripen some on a bed in the house, so we get to eat some too! Our house smells lovely at the moment! I will let you know next week if we do get some rain! 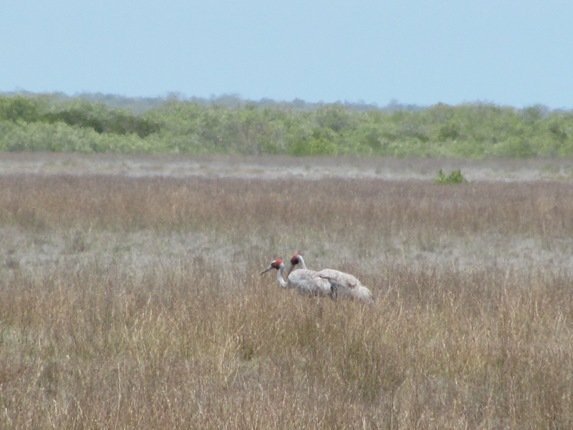 Never seen a Brolga… shame as all cranes are special birds. Impressive birds, Duncan…hope you get to see them one day! Wow, what a post. I am not sure what I am most envious about, the Brolgas, the potential presence of crocodiles and the excitement that brings (brown snakes must get boring after a while), or all those mangos. My brother-in-law is married to a lady from Thailand and her father – classic stereotype but there you go – runs a fabulous Asian restaurant in Hamburg. They frequently get truly ripe mangos freshly importet from Thailand and occasionally one of them ends up on my own dinner table. Unbelievable, no comparison to the turpentine-tasting crap we get at our groceries stores here in Germany. Yeah, I think the mango takes the cake for biggest mouth-watering factor in your post. 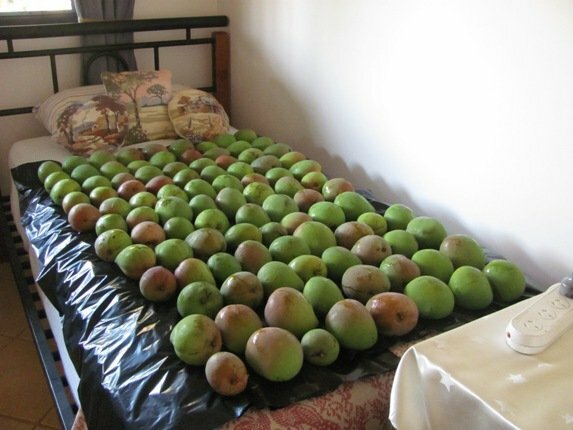 @ Jochen….so plan your trip to Broome around mango season then!! You can get 16 kilos in a bike basket which is handy when the streets are lined with mango trees! Birds Are Migrating South. It Must Be Fall!